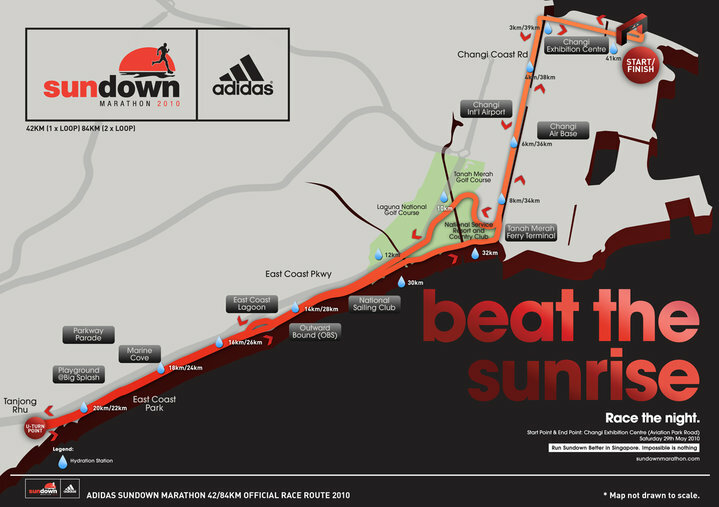 For the first time ever, im going to run a night marathon - Sundown Marathon in Singapore coming this Saturday night. A truly night marathon which start at 11.59pm comparing Putrajaya Night marathon which started at 8.00pm and Energizer Night race at 6.00pm. "Beat the sunrise" the tagline are mean for those 84km Ultra-marathoner where they will be starting from starting line at 6.00pm where the sun still burning hot.... they run until sun down.. and beat the sunrise to cross the finishing line. My running sifu and his gang are planning to tackle 84km with timing of 12-13 hours.... which mean, they hardly beat the sunrise! Good luck vin_ann. . .